GM CEO Mary Barra says being highly valued would mean earning “customers for life” and creating “significant” value for shareholders. DETROIT -- General Motors is counting on a parade of new technology-packed models to drive sales growth and profitability in North America and China over the next four years as part of an ambitious push to become the world’s “most valued” automaker by early in the next decade. The company’s China plan includes $14 billion in investments by its joint ventures to open five new auto assembly plants by 2018, with a goal of spurring sales in China to 5 million vehicles a year, from the current level of about 3.5 million. Also playing a big role in GM’s global strategy is Cadillac, which will introduce four new vehicles in North America next year, and nine new models in China over the next five years. GM shares rose 1.7 percent to close at $32.49 despite an overall down day on Wall Street. The automaker also said today its September U.S. vehicle sales rose 19 percent, just ahead of analysts' projections. By 2016, GM aims to achieve adjusted profit margins of 10 percent in North America, return to profitability in Europe by 2016, and maintain margins of 9 to 10 percent in China at the same time, said CEO Mary Barra, who outlined the plan at GM’s Proving Grounds here ahead of an investor conference. Barra said becoming highly valued would mean earning “customers for life” and creating “significant” value for shareholders. “We have the talent and global footprint” to accomplish that, she said. The comprehensive strategy is the first one laid out by Barra and her management team, which was put into place nine months ago following the departure of CEO Dan Akerson, but has been sidetracked by the company’s ignition-switch and recall crisis. It arrives as two key rivals are laying out similar long-range plans. Earlier this week, Ford Motor Co. said it aims to increase global sales 52 percent to 9.4 million vehicles by 2020, and raise profit margins to 8 percent to 10 percent, from the current level of 8 percent. Ford also lowered its forecast for 2014 operating profit to $6 billion, down from a previous goal of $7 billion to $8 billion, citing higher-than-expected warranty and recall costs, and higher losses in Europe. Volkswagen AG, which is targeting sales of 10 million vehicles a year and a profit margin of 8 percent by 2018, is expected to outline a strategy for 2025 by the end of the year. In her presentation, Barra made few references to changing GM’s culture -- a frequent refrain since its 2009 bankruptcy reorganization, and a burning topic in the wake of the internal investigation into the ignition-switch debacle. But she described the kind of company she wants to run. 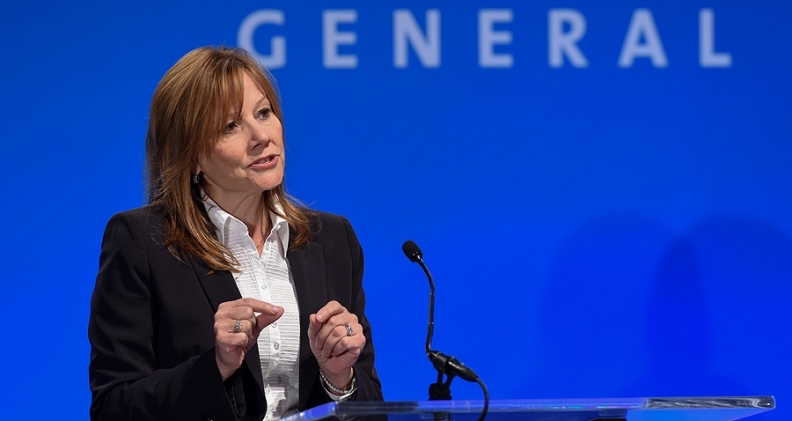 She said she wants to “reignite innovation and ingenuity” and make a GM a company that “has the tenacity to win” and “the courage to do what’s difficult” -- qualities that contrast with the plodding bureaucracy GM has been known for in the past. In a morning briefing for reporters, Barra declined to detail how many vehicles GM plans to launch in the new few years, but said new or recently updated cars and trucks will make up 27 percent of global sales volume in 2015, increasing to 38 percent in 2016 and 47 percent in 2017. The new vehicles will feature advanced technologies ranging from automated-driving features, to a mixed-material body structure combining steel and aluminum, to new families of lighter, more compact and more fuel-efficient engines. “We want to be on the leading edge of new technologies," Barra said. New vehicle architectures: GM is developing new platforms of interchangeable components to cut costs. By 2020, it expects 11 of these “vehicle sets” to account for 99% of its global production. Currently, GM uses 14 core architectures for about 75 percent of its global volume. By 2025, GM hopes it will use just four vehicle sets. The move is similar to the global architectures that Ford Motor Co. and Volkswagen AG have been rolling out for the last several years. Improved supplier ties: GM aims to improve relations with suppliers by sharing the risk of launching new programs and sticking to volume commitments. "We want to be the most desired company for dealerships, the most desired for suppliers," Barra said. Buffing up brands: GM hopes to improve the image and desirability of its brands. “We know our products don’t command the prices they should because of issues with the brands,” Barra said. She added that GM is going to work to boost the image of Chevrolet, with the goal of making it one of the top 10 global brands in rankings by Interbrand, a major marketing consultancy. Cadillac will buff its image by becoming a leader in safety and technology, she added. Capitalizing on megatrends: Barra said the auto industry is being reshaped by rapidly changing technology, emerging markets, increasing environmental requirements and shifting consumer needs. Automated driving technology, for example, will change how people use and relate to their cars, while about half of the world’s population still does not own a vehicle. “We believe this industry will change more in the next 10 years than it has in the last 50,” GM President Dan Ammann said. New product: GM has “an absolute onslaught of product coming” that is “key to driving the growth equation,” Ammann said. GM will launch vehicles in new segments, such as the new midsize truck hitting dealerships this fall. These segment-opening vehicles “should add a couple hundred thousand units [of sales] at least,” he said. They will be followed in the 2015-16 time frame by updates to high-volume vehicles such as the Chevy Cruze, Malibu and Equinox. Ammann said the new models will be more profitable than their predecessors. Customer loyalty: In the U.S. and other mature markets, GM wants to do a better job of retaining customers, mainly by connecting with them through technology like on-board 4G LTE broadband. Ammann noted that GM already has seven million connected customers through OnStar, and can offer them personal interactions through GM’s call centers, which employ 8,000 operators -- a force no other auto maker has in house. “We want to redefine how we engage with the customer,” Ammann said, adding that GM expects to see “pretty significant results” soon in improved loyalty.